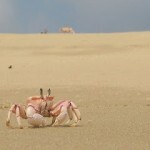 Crabs on the beach at Kizingo on Lamu: I have read people complaining on trip advisor about seeing crabs on the beach along this wonderful expanse of beach on the northern Kenyan coast. Quite extraordinary. These guys should stay at home surely? A bunch of us had an amazing time after Christmas and rented a simple house 25 minutes walk along the beach from Kisingo lodge. Perfect, and brilliant value for money.